I was browsing through Runner’s World today looking up training tips (half-marathon here I come!) when I stumbled onto an article about what to do with your old running shoes. EUREKA! Running shoes, unlike regular shoes, have a fairly limited shelf life if you run regularly. They’re good for about 300-400 miles. After that, support breaks down and the risk of injury goes up. So even if they look good on the outside, it might be time to send them packing. This is always a tough thing, at least for me. I love running, and my shoes are like little friends. My current pair is getting close (if not over) the 400 mile mark. So it’s almost time to say goodbye. Sigh. How do you know when your shoes need replacing? First, listen to your body. Do your joints hurt? Are you getting shin splints? Do your muscles ache? These are all signs that the support in your running shoes is growing thin. Do the twist test. Grab one of your shoes in both hands and twist. If the shoe feels firm, it’s probably still ok. If it twists easily, they need to be replaced. Check out your soles. The sole lasts much longer than cushioning and shock absorbency, so if the soles are worn then it’s definitely time for a new pair. Most organizations like Salvation Army will take “gently used” shoes. 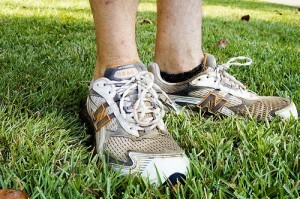 But if you’re a runner, then you know that often your shoes are much more than “gently used”. The good news is that you can donate your old running shoes to organizations that either recycle them, or send them to people all over the world. Shoe companies, retailers, and individuals can donate footwear both new and used to those in need around the world. Soles4Souls has coordinated relief efforts for the Asian Tsunami and Hurricanes Katrina, Rita, and Ike, netting over 1 Million pairs donated for these disasters. For more information about Nike Reuse-A-Shoe, go to: nikereuseashoe.com or call 800-344-6453. The complete list, posted here at Runner’s World, is really comprehensive. Please visit their site to see all the options-they did a really great job covering all the bases. Thanks Runner’s World! Fantastic information! I love running. I’m always sad when my shoes wear out. @Tammy- I wish our local running store did that. I’m going to print this list out and give it to them. Hopefully they’ll post it in their store for other runners. I am an advocate of barefoot and minimalist-footwear running. It’s much greener not to use running shoes at all, and run barefoot instead. Also, there are studies that demonstrate that runners actually get injured more easily using new running shoes than using old, beat-up shoes (and, of course, it’s greener as well, to keep using those old shoes, rather than buying new ones all the time). Of course, running barefoot is not something to be entered into lightly, it is a real commitment that requires research, patience and dedication (for most, a whole new running style must be adopted which requires different muscles, bones, and tendons to gradually become stronger). It might not be for everybody, but there is no arguing that it is definitely a greener way to exercise. I actually found your blog by looking for Terra Plana reviews, read your review of the vivo barefoot boots and shoes, and then browsing through your other entries was shocked to see this one! I second most of Joe Z’s comment–please try running in minimalist footwear, which the vivo barefoots are a great example of. I bought the vivo barefoot Lucy shoes back in June specifically for running, after reading Born to Run, and I switched over gradually and am now using them exclusively, and I’m really enjoying it! Don’t let Joe’s comment scare you too much-all you need to do is read a little bit beforehand, switch over gradually, and pay attention to your body and what running form is most comfortable as you switch over. It’s really not that complicated. I recommend you start by reading Born to Run, it’s a really fun and informative book and it will tell you why all that stiffness and support in your running shoes probably really isn’t preventing injury at all. One of my favorite things about my switch to minimalist shoes for running is the release from the environmentalist guilt about going through so many shoes. Did you read the runner’s world article about how running shoes are made? It’s terrible how many nasty chemicals they use and how much energy the whole process takes. I’m in the middle of reading Born to Run! I love it…I’m also now convinced that I need to make the transition to minimalist running. And, I also just found out that Terra Plana is about to release a minimalist running shoe called “Evo” this spring. I’m definitely going to get a pair for running (and review). Thanks so much for writing in! My names are Coach/Player Epah Gyvira and my brother Chrys Fusi in Tampa FL 33613.I am a Cameroonian by nationality and I am 39 years. I am football fanatic and this can be seen from my experience in the game of football. In Cameroon, i played for a good number of clubs and national tournaments. My football career in Cameroon has a lot of positive impact on my life. Due to my talent, I decided to travel to South Africa where I could show case my talent in the game of football. I played for many clubs in South Africa most remarkable is the ARCADIA SHEPARDS F.C. We emerged Champions of the VODACOM League in 2003-2004. I also did coaching management because of the love that I had for soccer. My career in South Africa has a remarkable legacy in my life. While in South Africa, i traveled to Japan for a test match but unfortunately, I was questioned for failure to renew my passport. Consequently, I was sent to Cameroon. The story is really a sad one. All what I had worked for in South Africa perished. Back in Cameroon, i did not give up my passion for soccer. I joined a few soccer clubs but it was always difficult to make it to the top. My soccer career in the pitch diminished but i still have the passion for soccer. Because of my Charisma and Talent, i was appointed coach of the Little Foot F.C ,Tiko D2. My coaching career with this club was poor because it was very difficult to transform the barbaric and uncultured talent of these African Children. The Academy is just 1 year 5 months old. I have a total of 60 boys ages and 51 girls ranging from 5-19. I want to use this soccer academy to eradicate the high level of illiteracy. Through this mission, I will pass on Hope and a brighter future to the underprivileged. I am mailing you today is to beg on behalf of this young academy, my community which has no sport club right now, and Cameroon in general to help us sport equipments. *We need sport shoes, equipment especially.